As you might have already read in the Audio Buses Tutorial, sound is sent to each bus via an AudioStreamPlayer. There are different kinds of AudioStreamPlayer. Each one loads an AudioStream and plays it back. An audio stream is an abstract object that emits sound. The sound can come from many places, but most commonly from the filesystem. Audio files, such as .wav or .ogg, can be loaded as AudioStreams and placed inside an AudioStreamPlayer. Audio files of type .wav are quite large, but use little CPU power to play back. Hundreds of them can be played simultaneously with little impact to performance. This format is usually best for short sound effects. Audio files of type .ogg are much smaller, but use considerably more CPU power to play back, so only a few can be played back (especially on mobile!). This format works well for music, long sound effect sequences, and voice at relatively low bitrates. There are other types of AudioStreamPlayer, such as AudioStreamRandomPitch. This one makes a random adjustment to the sound’s pitch every time it’s played back. This can be helpful for adding interest to sounds that are played back often. This is the standard stream player; it can play to any bus. In 5.1 sound, it can send to stereo mix or front speakers. This is a variant of AudioStreamPlayer, but emits sound in a 2D positional environment. When close to the left of the screen, the panning will go left. When close to the right side, it will go right. Area2Ds can be used to divert sound from any AudioStreamPlayer2Ds they contain to specific buses. 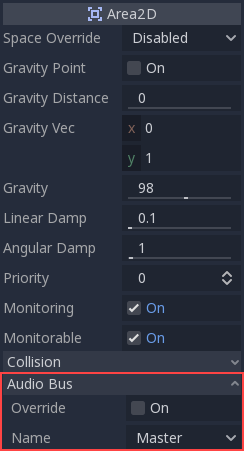 This makes it possible to create buses with different reverb or sound qualities to handle action happening in a particular parts of your game world. This is a variant of AudioStreamPlayer, but emits sound in a 3D positional environment. Depending on the location of the player relative to the screen, it can position sound in Stereo, 5.1 or 7.1 depending on the chosen audio setup. Similar to AudioStreamPlayer2D, an Area can divert the sound to an audio bus. 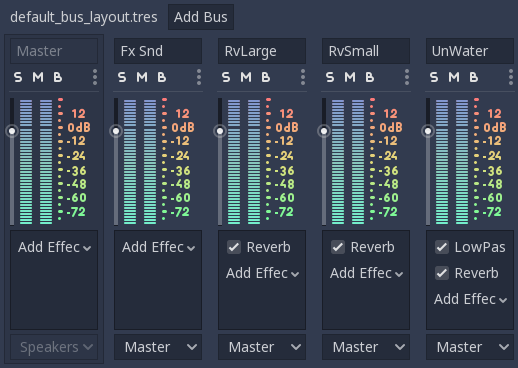 The Area Reverb Bus section also has a parameter named “Uniformity”. Some types of rooms bounce sounds more than others (like a warehouse), so reverberation can be heard almost uniformly across the room even though the source may be far away. Playing around with this parameter can simulate that effect. 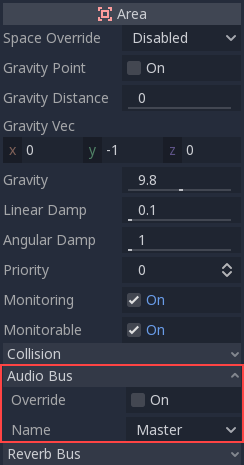 Enable it by setting it depending on how objects will be moved (whether on regular process or physics_process step) and the tracking will happen automatically.